College is expensive. I don’t know many people who would say otherwise. According to BigFuture, the average annual tuition cost for an in-state student at a public four year college is $8,655. For out-of-state students, that figure jumps to $21,706. The average private college cost approximately $29,056 annually. Private college costs also can climb significantly higher than that as well, with some private colleges costing $40,000 to $50,000 each year. The amounts above don’t even include the other costs of college, which may shock you as well. Other college costs may include lab fees, housing, supplies, books, meals, parking (nope, parking is usually not included! ), graduation caps/gowns (for one of my friends, it cost her $600 just to rent her cap and gown for graduation) and so on. 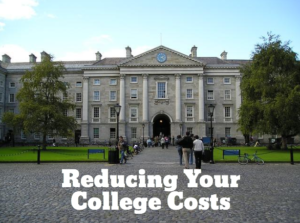 If you are looking to reduce your college costs, continue reading below. Take college classes in high school. If your high school gives you the option/opportunity to take college classes in high school, then you should try to sign up for them. You might be able to take off a whole semester or even a whole year by taking college classes in high school. It is usually much, much cheaper to do this as well! Attending a community college can usually save you a good deal of money. The classes are usually extremely cheaper. Instead of paying $500 and up for each credit hour, you could be attending a community college and spending less than $100 per credit hour. READ ALSO: Does Everyone Need an Emergency Fund? Even though community colleges are usually cheaper, you always want to make sure that your classes will transfer to the 4-year college that you eventually want to transfer to. You don’t want to waste your time taking classes that won’t go towards your degree and you definitely do not want to waste your money on classes that you do not need. Choose a college that is a better value. Just because a college has a high price tag does not mean that it is the best college. You should look at colleges that are good values for the major that you want to earn. Also, you should compare the value of two colleges before you pick one. Sometimes a $10,000 per year school is more valuable than a $40,000 per year school because there may be better degrees, better professors, better networking, and so on. There are thousands and thousands of scholarships and grants available to you out there, and you should be trying your best to apply for as many as you can. It is FREE money! Take more credits each semester. Something that I don’t think many people think about is that for many private colleges, whether you take 13 credit hours or 18 credit hours, usually you are paying the exact same cost. If you can handle the additional course load, you should try to take as many classes as you can. How much is college costing you each year?